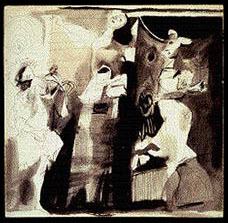 This is a very complex symbolic composition and a very important one for Picasso. It shares reveals a great deal of common symbolism with The Unknown Masterpiece. Common to both compositions are the the symbols of: a horse, a bullfighter, a sailor, a curtain, a ladder, an angel and a dog. 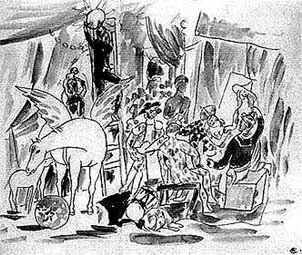 In addition, in one of the preparatory studies for the curtain, shown above, Picasso depicts a ladder surmounted by a star. This is a classic symbol for the stages of the alchemical process and its ultimate goal or attainment. This important alchemical symbol is related to a range of other alchemical motifs and symbols which are revealed in The Unknown Masterpiece. For more detailed information please refer to the following sections.